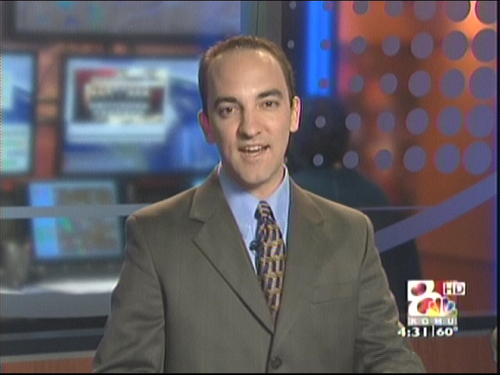 KOMU-TV, the NBC affiliate in Columbia, Mo. (and in NewscastStudio’s backyard) has taken the wraps off its new set and graphics. Details and more images after the jump. The set, from Devlin Design Group, has a great sense of depth and noteworthy lighting design. The weather center’s divider of frosted plexiglass is particularly effective in adding many layers to the look and feel of the studio, as shown below, and the lighting in this position particularly pops. Another highlight of the set is its dramatic lighting. KOMU has opted for a somewhat darker look that adds contrast and sophistication to the look. Gobos and other special lighting effects are prevalent throughout. Rich wood tones and lighting columns provide additional contrast between traditional and contemporary styles — a combination that’s quite successful and appropriate for a market that has a wide range of viewer preferences. 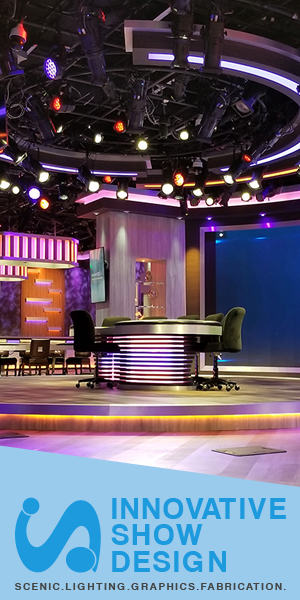 The set is equipped with two rear projection screens, one behind the anchor desk and the other in the multipurpose area that is also used for sports. 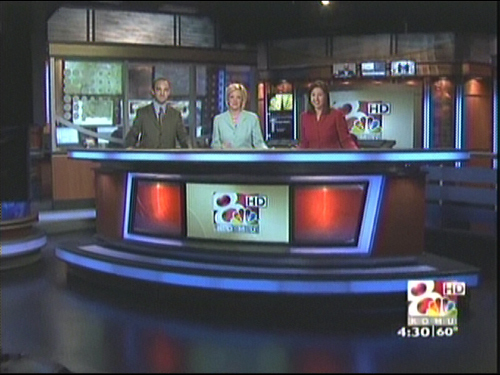 On the graphics end, KOMU has a new look from VDO. The package combines rich red with a silvery-gold hue, a slight deviation of the station’s previous look of silver and red. Other elements in the graphics package includes microtext, subtle vector curves and other “techy” elements. The other stations in the Columbia, Mo. DMA don’t have sets that even come close to this new look (it’s ranked 137th in the nation). However, it’s important to keep in mind that KOMU-TV is owned by the University of Missouri’s Missouri School of Journalism, so the station also serves as a learning laboratory for students. Having a new set that not only looks good but also functions well does play an important role in the training of journalists and technical staffers. It’s also the first new set the station’s gotten in quite some time and the station’s recent shift to HD news meant the old set wasn’t wide enough. For details on the new look, including a video report, click here.